We are supplier of Synthetic as well as natural Bees Waxe. 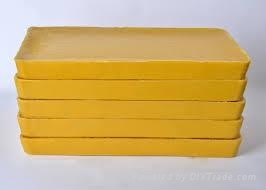 The Bees wax we supply are in form of slabs or Pestilles. The colour of the product is White and yellowish. Please visit our website for more details. All our products are of best quality and we ensure our customers are satisfied with the product and services we provide.